Logitech Wireless Number Pad N305 gives you convenient number entry for notebooks. Up to three years of battery life and a wireless receiver you leave plugged in means it’s always ready. Meet the Logitech Anywhere Mouse MX. It's the wireless notebook mouse that gives you new freedom to work anywhere without a mouse pad—on virtually any surface. Your laptop bag balanced on your lap at the airport. Your granite kitchen countertop. It even gives you precise cursor control on glass conference tables and hotel desks—the surface where no mouse has worked before. From the first track-on-glass technology to a tiny USB receiver that never needs to leave your notebook, this compact mouse is ready to help you fly through any task anywhere you go. 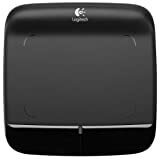 Logitech Wireless Touchpad. Point, scroll, swipe-naturally. With intuitive, gesture-based controls, it's a snap to point, scroll and swipe your way to wherever you go on the Web and more. Plus, the large touch surface gives you plenty of room to let your fingertips do the clicking. 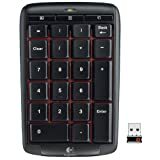 The Logitech Keyboard Controller is a keyboard-based remote that gives you a natural way to search, find and enjoy what you’re looking for on Google TV systems. Logitech Harmony Link. Turn your iPad, iPhone, iPod touch or Android smartphone into the smartest remote in the house with the free Logitech Harmony Link app. Looks like a beauty. Sounds like a beast. With its compact design, travel case and rechargeable battery, this high-fidelity speaker lets you play up to 8 straight hours of music wherever you go.With the Apple seal of approval, you have the ultimate assurance that your speaker will work flawlessly with iPod and iPhone.Take your music anywhere-your included travel case holds the compact speaker, A/C adapter and remote control. Logitech Revue with Google TV turns any TV into a smart TV. It brings together TV, the full web, apps, movies and more and puts control of it all at your fingertips. This webcam looks good. Might get it for my son.